How cool is it to live in the Bay Area where Culinary Diversity is at an all time high? how much do we want to spend on quality food. the type of cuisine. Since my wife and I can never decide where we want our next burger, burrito, pizza, or romantic night out, foodspotting.com is as valuable a tool in helping us decide as opentable.com. The goal of this blog is to journey into some of the best food this region, state, country, and world, have to offer. 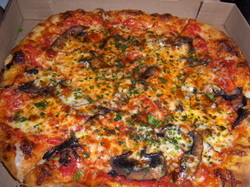 Each day we will review a different dish on this site, as nominated through a certain foodspotting challenge. We encourage your comments and additions, even if you don't want to become a foodspotting addict like ourselves, hopefully you get an idea of what you would like to try.. Enjoy! I signed up for a new foodspotting account and applied for 32 different challenges. Now I had to decide what was going to pop the cherry and be the inaugral posting on this blog. The wife was out Christmas shopping with her sisters and I was left alone to watch the Packers humiliate the 49ers so I was not feeling too good about Sunday. With 12 minutes left in the 4th Qtr, and my beloved Niners down by 15 points, I decided a 1/3 lb Buffalo Meat Western Cheesburger was in order from Bullshead in West Portal.. So I get down to West Portal and cannot find parking to save my life. 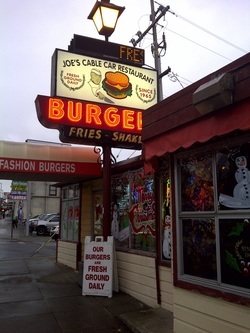 After two trips around the block, I decide its time to head down to Joe's Cable Car on Mission and Silver... I order a 1/3 lb bacon cheeseburger and a beer which with tax sets me back $22.45.. Mind you I did not get fries or any sides. Are you kidding $22.50 for a burger and a beer? Wow.. I don't care if this is hand ground chuck its good but its certainly not NY Bistro Japanese Beer Fed beef with black truffles and dinosaur bacon good.... Whomever nominated this obviously has deep pockets! Challenge Completed- " I can't believe it's not in The Big Eat 2010!" 1 out of 97 tried!!! So its midnight... and I go to raid the fridge for a little snack. 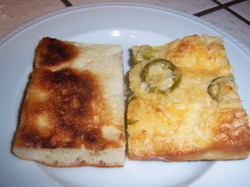 I realize that there are several pieces of jalapeno cheese foccacia left over from a belated Thanksgiving Party we went to last Monday Night. This particular foccacia comes from a little place in North Beach known as Liguria Bakery. A quick check of foodspotting reveals that foccacia bread from this bakery is on the 7X7 Magazines 2010 Big Eat 2010 Scavenger Hunt. All of their foccacia breads are made in small batches and they open early in the morning. Once the bread is gone, the bakery closes up shop, usually before 1:00pm. The foccacia makes awesome home made sandwiches (Just add Meat/Cheese/Condiments) and is well worth the wait in line.. Just don't make the same mistake I made the first time I ordered from them and ordered the "plain" thinking it came with the tomato sauce.. Nope, just plain foccacia bread...The price is right with most of the variations ranging from $4.00-$5.00 and the Jalapeno/Cheese topping off the menu at $5.50. Each order will yield nine very nicely sized pieces. 1 out of 100 Tried!!! Time to get ready to put up the Christmas Decorations. While we haven't got around to getting a tree, I decided to go over to my parents house and pick up the ornaments, wreaths, and stockings which we had stored over there during recent renovations to our house. 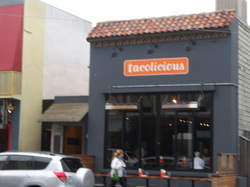 My parents happen to live very near to Tacolicious on Chestnut and Fillmore and I had to stop by and try the Braised Short Rib Taco. I ordered four tacos for $12. The tacos are smaller than a roach coach taco version but much more flavorful. I tried a Carnitas (my favorite,) Chorizo and Potato (not so good,) the battered Cod (pretty good) and of course the Braised Short Rib as that is what all the hype on foodspotting is all about. The meat was chewy and it felt as if I was eating pot roast as the beef flavor was there, but there was really no other flavor to write home about. 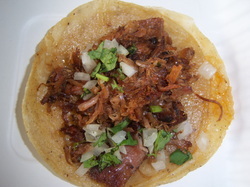 As I stated above, I really liked the Carnitas Taco which is the one I would recommend. 2 out of 100 Tried!!! A great hidden secret within the San Francisco food community is Arizmendi Baking Coop, located on 9th Avenue between Irving and Judah. This Cooperative has other locations spread throughout the Bay Area, but the one on 9th and Irving is the original. The secret to this place is that they make one special pizza a day, and sell these pizzas either already fully baked or half baked, until they sell out. The pizzas are fresh, and they only use the best products. The trick is to check their website where they have calendered out what each daily pizza is going to be for the month. I had been anxiously waiting for today's offering which was a pizza with their home made tomato sauce, goat cheese, and garlic oil. I went down to pick my pie up promptly at 1130 am, which is when the pies first come out of the oven (See below attached pic.) 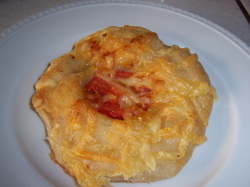 How convienant that a Foodspotting member had selected an Arizmendi Tomato and Cheese Bialy as one of the items on the "I Can't Believe Its Not In the Big Eat 2010" list. So I had to pick one up... On first look, it did not look all that great... baked cheese on toast with a tomato in the middle... But once I brought it home and microwaved it for 45 seconds this bialy was transformed into savory goodness!! If you find yourself down on Irving or Judah Street during the day, stop into Arizmendi and pick one of these Tomato and Cheese Bialy's.. Ask them to heat it, get a cup of coffee, and you are set.. All for under $4.00. Challenge Completed- I can't believe it's not in The Big Eat 2010! 2 out of 97 Tried!!! What to eat Tonight for dinner.. I had a long day at work, the wife is sick on the couch, hmmm maybe an Atomica from Gialina's on Bosworth and O'Shannaussee? I ordered the pie with extra cheese to go. I'm usually not a crust guy, but Gialina's crust is awesome. Thin crusted and crisp it to me is like eating the perfect bread stick. The pizza comes with six slices, which I ate all of.. I didn't eat breakfast or lunch. The pizza is spicy but good. At $15.00 plus 3 bucks more for the extra cheese, this was worth the effort. The only knock that I have on this spot is the staff is just plain uppity... They stop short of being rude, but I kind of felt like how I would imagine an African American going into a Southern Coffee shop right after the Plessy V. Ferguson Decision... And I'm not African American!!! Challenge Completed- I Can't believe its not in the Big Eats 2010! Had a hankering for a BLT today but wanted a quality one. 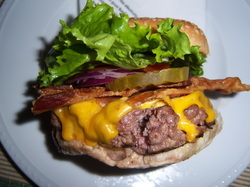 I read on foodspotting about the NEO BLT that Food Inc. sells. Food Inc is a high end deli/bistro that makes pizza's, salads, sandwiches, and other hot entrees like Gumbo, Polenta, Pasta's, etc. 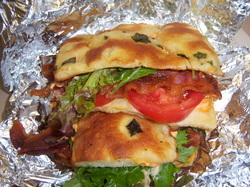 The BLT is served with a spicy mayonaise and served between two slices of fresh foccacia. The Bacon used was thick, and cooked to perfection. This is was a quite a nice sandwich for the $7.50 I shelled out for it. Food Inc. is located on California Street at Divisadero. I am anxious to go back and try some of the hot entrees that they offer. Tell Me What You Think/What Have I missed?